A decade ago, you would have been locked in a looney bin if you told people YouTube would become a platform for celebrities who work full time on the website. Well, here we are, and YouTubers make a lot more money than most of us. It was only a matter of time before this trend found its way into a game. 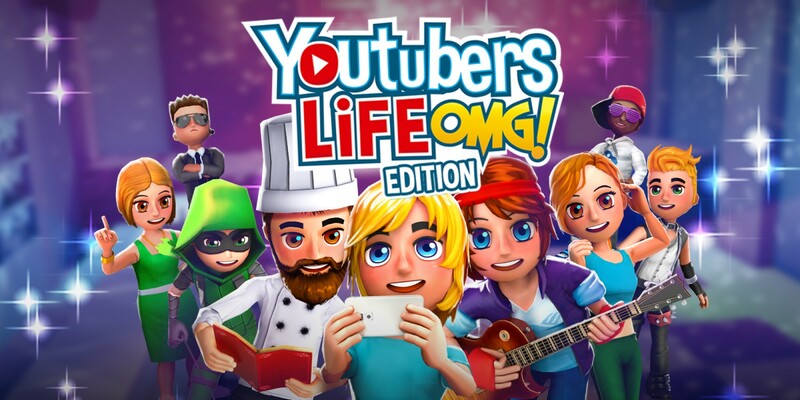 Welcome to YouTubers Life OMG, a sim/tycoon style game where you must rise up from a lone YouTuber in your parent’s house, to a successful brand with employees, adoring fans, and plenty of videos. Should you try to live the virtual dream, or is this game a nightmare? Let’s find out! When you start your journey, you’ll need to choose a profession. The options here are gaming, music, and cooking. You can probably tell what I first picked, but I did sample the others to see the differences. Gaming remained my favorite of the three, but there’s a fair amount of difference in how you approach each type of channel. While it essentially boils down to making videos, upgrading your equipment, and forging relationships with other online celebrities, there’s enough variety in the aesthetics and the purpose of the videos to make things feel interesting regardless of your choice. As a burgeoning YouTube gaming channel, I focused on playing the hottest titles and varying up my strategies for each video. There’s a lot to take in when you first start YouTubers Life OMG, so don’t let the cutesy graphics fool you. The tutorials do a decent job of setting you up, but navigating the menus and unlocking more options for the video types and equipment you can use will take time. YouTubers Life OMG also started life on the PC, and that shows here. You’ll use various button and trigger shortcuts to rotate and zoom, which is fine, but walls don’t become transparent when you’re changing the angle, thus making it difficult to establish a viewpoint in certain scenarios. It’s slightly annoying at times, but the general gameplay loop of YouTubers Life OMG is pretty addicting. In addition to managing your channel, you’ll need to eat, sleep, and at least in the beginning, study for tests while you live at home and go to school. Making the actual videos is pretty fun too. In the gaming side of things, you’ll select your equipment, the game, the type of video, and then it’s off to the races. During the recording process, you’ll also receive various options on how to react or fill out the content in the video. These all play into different categories, which you can augment during the rendering process. Adding additional effects or flourishes to the video will use up your rendering points (which are based on your computer’s complexity), so there’s a good amount of strategy in how you want to position your videos and appeal to your audience. Even something as simple as moderating comments gives you some insight into how you should proceed. If your fans are loving the game you’re playing, then keep it up! If they are all against your style or your videos, then it’s time to switch things up. The opportunity to attend events, forge relationships both personal and professional, and eventually hire employees gives YouTubers Life OMG plenty of mileage for those who enjoy the management tycoon genre. The unwieldy controls can sometimes work against your progress, but the general gameplay loop is surprisingly fun. It could have offered more options for channel types, and perhaps deeper complexity in the recording process, but what’s here is more than one would expect from a game about being a YouTuber, so that alone is a welcome surprise. YouTubers Life OMG for the PS4 has a colorful, but simplistic art style. It works fine, but it could have done with more detail in both the visuals and animation. It’s not difficult to ascertain what’s going on in any scene, but the added detail could have made the video creation process more engaging. With more depth and polish, YouTubers Life OMG could have been the next great tycoon game. Despite these issues, it still has a surprisingly fun gameplay loop that fans of the genre will certainly appreciate. It doesn’t make me want to go out and start my own YouTube channel, but it did give me a nice taste of that life.